Who can guess, all there is, that might be lurking down there? In industrial Maspeth, where I spent last Sunday afternoon, are the relict maritime industrial bulkheads of a corporate outfit called Phelps Dodge, which has long since “left the building.” The Phelps Dodge property has been divided up, sold off, and developed separately. 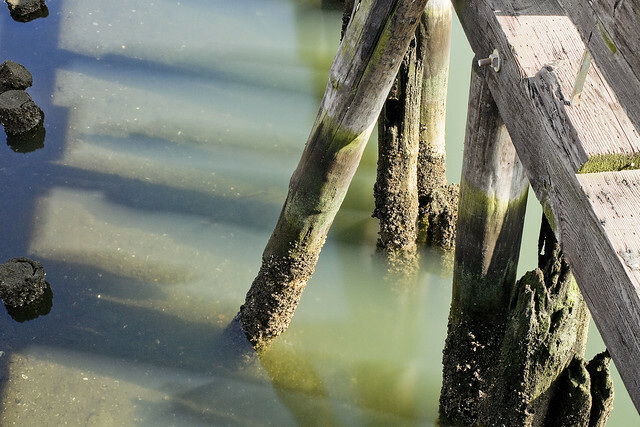 The company, which was in the copper refining trade along Newtown Creek, is one of the “PRP” or “potentially responsible parties” originally named in the EPA’s 2010 Superfund declaration for the waterway. Although there isn’t even a sign indicating they were once here, Phelps was one of the largest employers on the Queens side of the Creek for more than a century. The first incarnation of what would become the Phelps Dodge plant on the LIC/Maspeth border planted heir stakes here in 1872 as “G.H. Nichols and Co.,” later becoming “Nichols Chemical Co.” in 1891 and then “General Chemical Company” in 1899. In 1930, the so called Laurel Hill plant was purchased by the Phelps Dodge corporation. At it’s height, the plant directly employed 17,000 people. They manufactured several chemicals here, but their main product line centered around sulfuric acid. The Phelps Dodge people were copper refiners, ultimately, and used the acid to free metal ore from the rock it was embedded in. The Laurel Hill Plant declined, and in 1984 it was shuttered. The United States Postal Service purchased the site from Phelps Dodge in 1986, hoping to use it as a truck storage yard, but it was soon determined that the property was too contaminated for use as a parking lot and a judge ordered Phelps Dodge to buy back the property in 1996. In 2001, the old factory and acid mill buildings were torn down, and the property was subdivided into lots. At one of these lots, the Restaurant Depot wholesale chain erected a location. On another, the Koscisuzcko Bridge replacement project is playing out, and on yet another a brand new Federal Express shipping hub has been created. 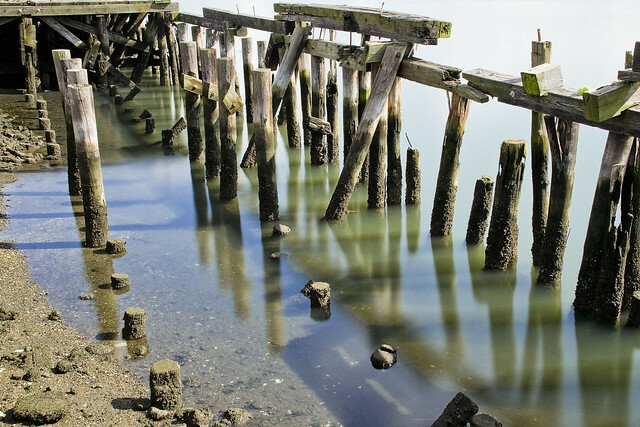 The shots in today’s post depict the last vestiges of Phelps’s long occupancy, the remains of heavy piers which carried terminal railway trackage on them, allowing for barge to rail operations at the acid factory and copper refinery. The Phelps Dodge property is found just to the south of the LIRR’s Lower Montauk tracks, along a section known as “deadmans curve.” The nickname for this section of the tracks is due to the Berlinville Rail Disaster in 1893 (two LIRR passenger trains collided at speed, engine to engine) and the habits of Phelps Dodge workers who would routinely attempt to run in front of and outpace the trains when crossing the railroad tracks, resulting in a lot of squished employees. 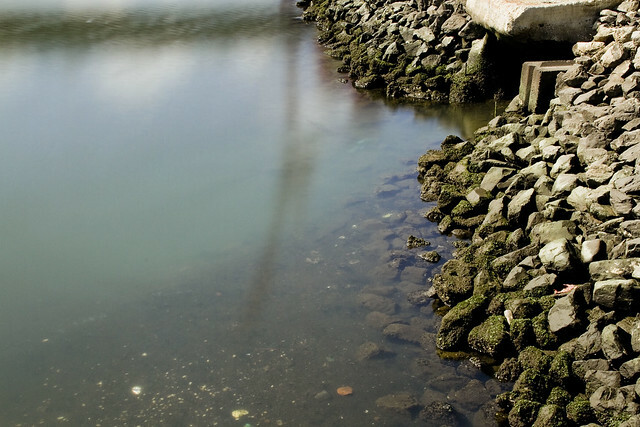 Modern day 43rd street used to be a colonial era pathway that crossed modern day Queens from the forbidden northern coast of Queens’ Berrian and Riker properties at Bowery Bay in Astoria, then ran south and across the swamps at modern day Northern Blvd. and then over the hills of Middleburgh (Sunnyside) and then down to Newtown Creek through Maspeth. This path was paved with crushed oyster shells, and hence was called “The Shell Road.” It’s a little hard to visualize this in modernity, because y’know… Robert Moses. The Long Island Expressway, BQE, Queens Blvd., Northern Blvd., and the Grand Central Parkway all conclude this ancient pathway. 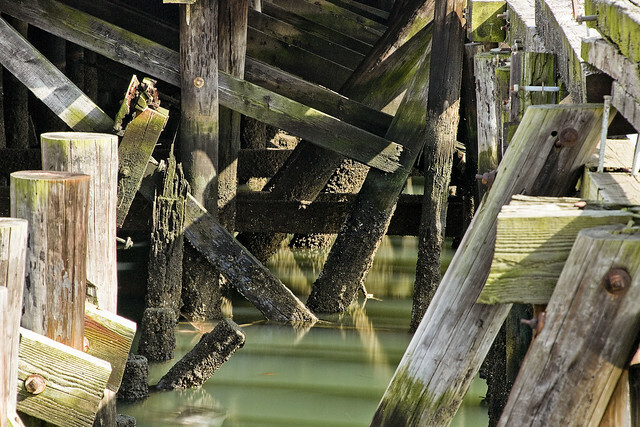 What I can tell you for certain is that these collapsing and rotting heavy piers look pretty cool and make for good lens fodder. 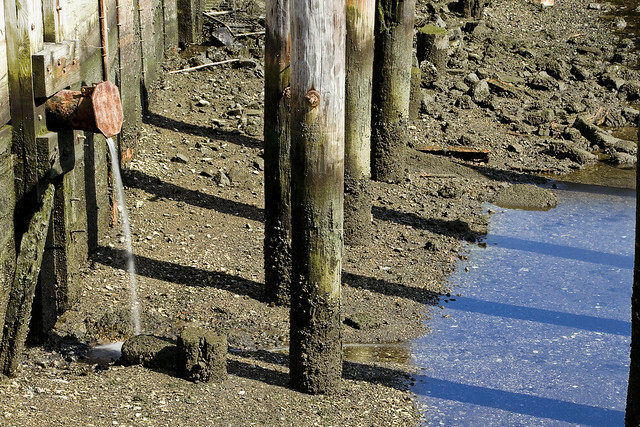 That water pouring out of the pipe you see is a permitted “SPDES” outfall, and connected to the Kosciuszcko Bridge project. 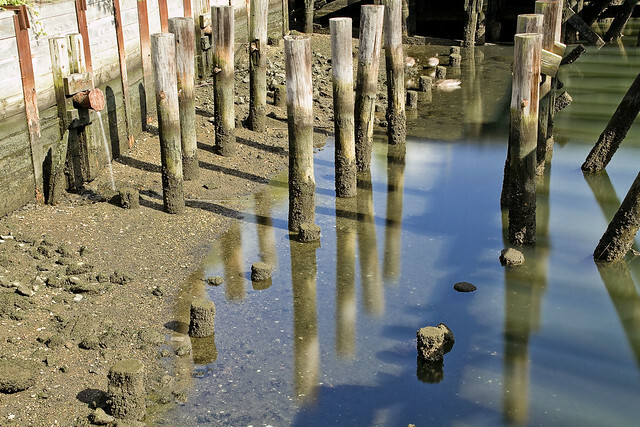 It was a late afternoon low tide period when these shots were captured. With all the rain we’ve been getting, the “eau de Creek” was particularly strong and inescapable, amplified as it was by a dew point humidity up in the 75% range. A humble narrator was also cooking in the early August emanations of the burning thermonuclear eye of God itself, and there were a few times when touching the camera that I was concerned about how hot it was getting. Mitch, we called whats buried there ”Scuzz”, and Methylethylbadshit.